Cornish author and historian Joan Rendell died after a woollen blanket over her knees caught fire, an inquest has heard. 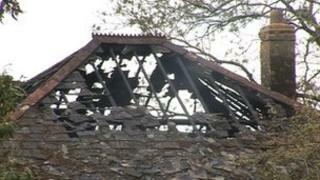 Ms Rendell, 89, died in May 2010 after fire swept through her bungalow in Yeolmbridge near Launceston. Fire investigators said a woollen blanket caught light as she sat in front of a two-bar electric fire. Cornwall coroner Dr Emma Carlyon recorded an open verdict at the hearing in Truro City Hall. The inquest heard that Ms Rendell's home was in chaos from her passion for matchbox collecting. Ms Rendell had a collection of 300,000 matchboxes, which was thought by some to be one of the largest in the world. Her body was discovered in the ruins of her home. Advanced forensic science techniques were used to get a match between the body samples and hair from Ms Rendell's wig. Many of her books and archive material was saved from further damage by firefighters who rescued the material from the remains of her home.